Migraines are a severe and debilitating type of headache which may be accompanied by other symptoms such as visual disturbances, nausea and vomiting. A migraine can last for days and often cause the sufferer to have to lie down in a darkened room until they pass. This can have a serious negative impact on their quality of life. There are many medications available to treat and prevent a migraine headache. However, these can cause side effects and are not always effective. Many people now prefer to treat their migraine headaches naturally using supplements, herbal remedies and other therapies. Earthing is the practice of bringing the body into conductive contact with the earth to bring about a wealth of benefits including reducing stress and calming the autonomic nervous system, which is a contributing factor in migraines. The mechanism behind what causes migraines is still not fully understood. It was previously thought that migraines were caused by a dysfunction of the blood vessels in the head. Although this is certainly a factor, we now know that the root cause lies deeper, within the central nervous system. When a migraine headache is triggered, this starts a complex cascade of chemical reactions. This leads to inflammation and overstimulates the trigeminal nerve, a major pain pathway of the face and head. This spreads to nerves in the meninges, the membranes covering the brain, resulting in pain and other symptoms. It has also been suggested that there is a strong link between migraines and gastrointestinal disorders, as well as possible genetic factors. In some people, migraines result in stroke-like symptoms including slurred speech or weakness on one side of the body. In rare cases they can even cause paralysis or loss of consciousness. A migraine headache can last between 4 and 72 hours, and often follows a pattern involving five different stages; early warning symptoms, aura, headache, resolution and recovery. These can occur up to 24 hours before the onset of a migraine and include changes in mood, digestive disturbances or neurological symptoms such as pins and needles. An estimated 20-30% of migraine sufferers experience an aura. This occurs between 5 and 60 minutes before the headache and includes visual disturbances such as flashing lights, seeing zigzag patterns or loss of vision. This can come on up to an hour after the aura stage and last anywhere from a few hours up to three days. There are certain things which may help to resolve the migraine including sleep. Some people feel better after vomiting. Up to 24 hours after a migraine, the sufferer can feel drained or “spaced out”. However, some people actually feel more energetic following a migraine. Some of the medications used to relieve a migraine headache include traditional painkillers such as paracetamol, stronger opioid painkillers and non-steroidal anti-inflammatory drugs. These are often combined with anti-emetic drugs to prevent nausea and vomiting. Unfortunately, once a migraine has begun, it can be very difficult to treat and these drugs are often ineffective. A newer class of drugs called triptans are now frequently used and can be effective if taken as soon as migraine symptoms begin to appear. Some commonly prescribed examples are sumatriptan and zolmitriptan. For frequent migraine sufferers, preventative medications may be prescribed. These include calcium channel blockers, beta blockers, anti-seizure medications, antidepressants such as serotonin antagonists, and ergotamine compounds. All of these medications, whether they be for treatment of prevention, carry the risk of side effects, some of which can be serious. This is why doctors such as Dr Mark Hyman and Dr Stephen Sinatra now recommend trying natural strategies first to treat and prevent migraines. Dr Mark Hyman, editor of the Journal of Alternative and Complementary Medicine, recommends identifying and addressing the root cause. Migraines can be triggered by dietary, environmental or hormonal factors. These include trigger foods, hunger, dehydration, exposure to bright lights or loud noises, lack of sleep, menstruation, hormonal contraceptives or menopause. Eliminating foods containing gluten, dairy, eggs and yeast can help in some patients. Taking a daily probiotic along with omega 3 supplements and enzymes may play a role in maintaining gut health and preventing migraines. Chemicals in food such as aspartame, monosodium glutamate, nitrates, nitrites, sulfites and tyramine can contribute to migraines. Try to eliminate these from your diet and eat more plant based, natural foods instead. Taking more exercise, reducing stress levels, and eating a healthy, balanced diet can all help to keep your hormones in check and migraines at bay. Magnesium supplements may help to prevent migraines. Exercise caution taking these if you have kidney disease and always consult your physician first. Mitochondria are the powerhouses of your cells and if they are not functioning correctly this can cause all kinds of issues. Taking supplements such as vitamin B2 and Co-enzyme Q10 may help. There are many ways to manage migraines naturally and a combination of these modalities is often most effective. The first approach is eliminating dietary and environmental triggers. These can be identified by keeping a “migraine diary”, which many people find helpful. Some common dietary triggers include chocolate, cheese and wine which contain chemicals like nitrates, nitrites and sulfites. Eat a balanced diet including plenty of fresh fruit and vegetables, whole grains and protein and reduce processed foods and refined sugars. In addition to this you might want to consider taking supplements including B2 (riboflavin) and Co-enzyme Q10, magnesium, omega 3 and probiotics. Herbal products such as feverfew and butterbur may also help in migraine prevention. Therapies such as acupuncture, osteopathy and massage can help to reduce stress and inflammation and address any structural imbalances which may be contributing. Cryotherapy is thought to help prevent migraines by controlling constriction and dilation of blood vessels, reducing inflammation and influencing the autonomic nervous system. The autonomic nervous system is the communication system between the brain and the gut which is now thought to play a major role in migraines. Another strategy which has a positive effect on this is earthing. 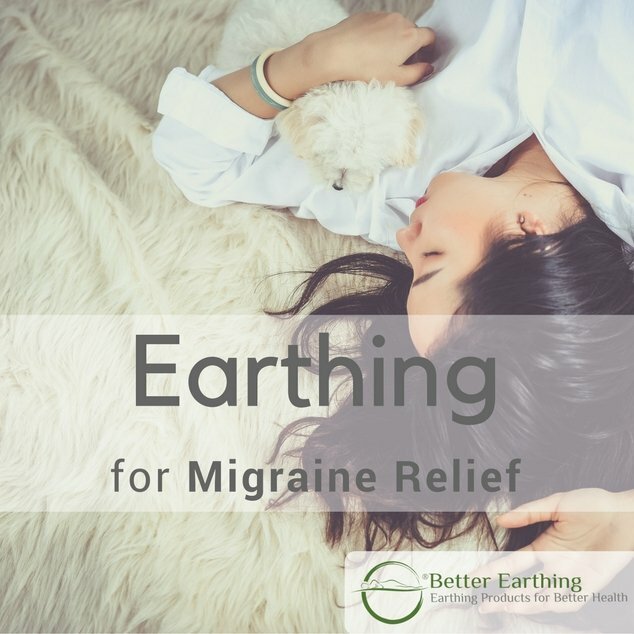 This practice not only rebalances the nervous system but also reduces inflammation and relives stress and pain to provide safe and natural migraine relief. Earthing, also called grounding, works on the principle that the earth’s surface holds a subtle, negative electrical charge. This is due to the presence of free electrons which are formed by lightning strikes happening across the globe at any given moment in time. In the human body, these free electrons act like powerful antioxidants, fighting free radicals and protecting us against disease. In the past, people were in constant contact with the earth since they walked barefoot or wearing shoes made from conductive animal skins. Now we wear rubber soled shoes which insulate us from the earth’s charge, and it is perhaps no coincidence that in modern times we have seen a sharp increase in conditions such as cardiovascular disease and diabetes. It is thought that by bringing us back into conductive contact with the earth, earthing has a wide range of beneficial effects including resetting our biological rhythms, improving sleep, reducing inflammation and relieving stress and pain. This can be done by simply walking barefoot on a conductive surface such as grass, sand or unpainted concrete, or using an indoor earthing product. Research has shown migraine to be caused by dysfunction in the sympathetic nervous system. The autonomic nervous system, the connection between the brain and the gut is now also thought to play a major role. One of the effects of earthing is to calm and rebalance these systems. The 2011 study Emotional Stress, Heart Rate Variability, Grounding, and Improved Autonomic Tone: Clinical Applications (Chevalier, G. Sinatra, S.) looked at the effects of earthing on heart rate variability, a measure of autonomic nervous function. It took 28 relatively healthy subjects who were seated in a comfortable recliner and grounded to earth via conductive patches on their hands and feet. They remained ungrounded for the first 40 minutes, followed by 40 minutes grounded and then a further 40 minutes ungrounded. During this time they had their heart rate variability measured by ECG. The study found that heart rate variability improved significantly during the grounded period, suggestive of improvement in the autonomic nervous system. This 2010 study was of a similar design but measured pulse rate, respiratory rate, blood oxygenation, perfusion index and skin conductance. It found differences in all of these factors following earthing, but perhaps the most significant was the decrease in skin conductance which happened almost immediately as earthing was commenced. Raised skin conductance is a measure of overstimulation of the sympathetic branch of the autonomic nervous system. Therefore, this dramatic reduction confirms the regulatory effects of earthing on this. The simplest way to experience earthing is to go outside, kick off your shoes and walk barefoot on the surface of the earth. Pay attention to your body and see if you notice any feelings of relaxation either in your muscles or mood. To experience the benefits of earthing on a daily basis, consider an indoor earthing product such as a conductive mat, pad or sleep system. This is a convenient way to earth in the comfort of your own home and maximise the positive effect on your health and well-being. Chevalier G, Sinatra S. ‘Emotional stress, heart rate variability, grounding, and improved autonomic tone: clinical applications’ Integrative Medicine: A Clinician’s Journal. 2011;10(3). Chevalier G, ‘Changes in pulse rate, respiratory rate, blood oxygenation, perfusion index, skin conductance, and their variability induced during and after grounding human subjects for 40 minutes.’ Journal of Alternative and Complementary Medicine. 2010 Jan; 16(1): 81-7.